Be welcomed with a warm chocolate chip cookie upon arrival at the DoubleTree by Hilton Hotel & Residences Dubai – Al Barsha. Located just behind the Mall of The Emirates, in the exciting Al Barsha area of Dubai, the hotel is surrounded by numerous high-end shops, restaurants and entertainment options. Visit popular Dubai attractions including the Burj Khalifa and “The Walk” at Jumeirah Beach Residence, all close to the hotel. A complimentary shuttle service runs from the hotel to Jumeirah Beach and the Mall of The Emirates. 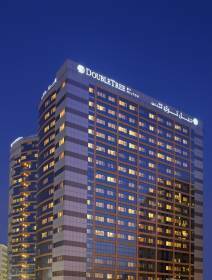 Downtown Dubai and numerous key business areas are all easily reached via the nearby Dubai Metro. Dubai Airport is only a 30 minute drive from our modern Dubai hotel.All of our spacious guest rooms, suites and one and two-bedroom apartments feature a variety of amenities to make you feel at home, including air-conditioning, a 42-inch TV, an ergonomic work desk and WiFi. Host a successful event at this hotel in Dubai with three flexible meeting spaces and stay productive in the modern, 24-hour business center, offering a range of services and amenities. Start your day with a breakfast buffet in the All-Day Dining Restaurant – a relaxed venue serving international cuisine for breakfast, lunch and dinner. In the evening, unwind in the Lobby Lounge before enjoying tempting dishes in the Indian Restaurant. Energize with a workout in the 24-hour fitness center or cool down with a dip in the sparkling outdoor swimming pool.